To attain accurate mold filling analyses, we must consider a machine’s movements, including screw acceleration and deceleration in the injection process; the machine reaction at the moment when filling turns into packing; and the machine’s protection behaviors for preventing injection pressure from being too high. Currently, the core of molding equipment is injection machines. Therefore, under Industry 4.0, smart machine applications will rely on injection machine design. Applications include: 1. The injection machine sends back production management data; 2. The data exchanged among the injection machine and the peripheral assistant machines; 3. The smart adjustment to the molding process. The smart adjustment on the molding process dictates the future of injection molding industries. Until now, the development in this industry still highly relied on people’s experience. Neither mold filling analysis nor smart machines can be substituted by people’s experience. Nevertheless, along with data induction and management as well as production information collection, we are not far from automatic trial molding. 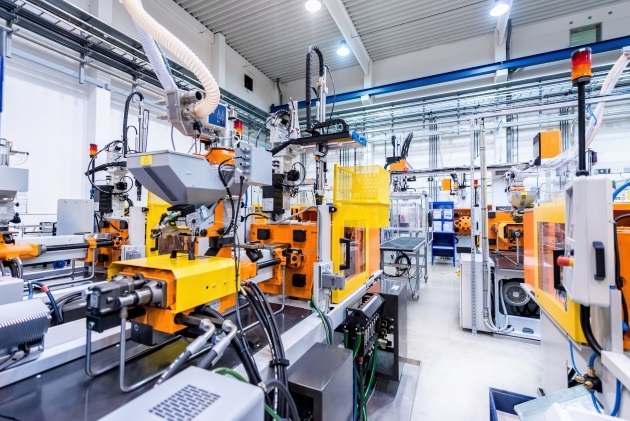 In this article, we will discuss how injection machine manufacturers apply injection information collected from the injection process to enhance product quality stability. To increase product quality stability, we can properly adjust molding parameters to offset the quality instability caused by the environmental variations. Based on their experience, molding professionals know they sometimes must adjust molding parameters to offset the effects of temperature during the day and during the time of year. Smart machines will directly change the molding conditions at every molding cycle through scientific methods. Currently, the major technology players in this field include Engel (iQ flow control), Wittmann Battenfeld (HiQ-Flow) and KraussMaffei (APC). Take Battenfeld HiQ-Flow as an example. The technology sets up the upper and lower limits of the injection pressure variation of the qualified product range by monitoring the injection pressure. That is, taking the qualified product’s injection pressure curve as the standard. If the mold, melt viscosity and injection pressure all remain the same, the injection pressure does not change. However, if the mold environment (the runner balance of a multiple-cavity mold or the mold temperature) or melt viscosity (melt temperature uniformity, degradation and batch difference) change, the injection pressure curve will fall out of the qualified product range even under the same injection speed. It will cause unstable product quality. Injection pressure is the product of shear rate and viscosity. If we observe a decrease in the injection pressure while the machine injection speed remains the same, it means the melt viscosity has decreased. Usually, it is caused by the increase of temperature. Meanwhile, the melt density decreases due to higher temperature. Therefore, if we want to keep the product weight the same, the injected volume/stroke should increase, or the VP switch point should be deferred. How much it should be deferred depends on how much this molding pressure deviates from the standard line of the qualified products. Injection machine manufacturers have different methods for this issue. Battenfeld’s adjustment is according to the equality of pressure and total area under the position, that is, the equality of the work of injection during the injection process. KraussMaffei’s adjustment is according to the compensation of the PVT properties. This means the material density (specific volume) changes as the temperature changes knowing that the injection pressure is different from the baseline. We can understand that the injection machine has transformed from a simple provider of melt kinetic energy to a role as a sensor. We can also understand how the melt is injected into the mold so that we can further adjust the process for the melt behaviors under different temperatures and pressures. This helps us to achieve the goal of realizing smart machines. The immediate adjustment during production can be realized as “predictive manufacturing.” According to Dr. Jay Lee, predictive manufacturing means not only to create the value of manufacturing but also to add the “introspection” function to the manufacturing process. In other words, the whole system, including the equipment itself, must take immediate actions to adapt to the changes in the manufacturing process. On the Cross-Strait CEO Summit 2018, Dr. Lee, who has just taken over the position of the vice president of Foxconn Industrial Internet (FII), said, “smart manufacturing is not born to solve problems, but is born to perceive and predict the problems, and solve the problems that we could not solve in the past.” Therefore, we can say that the era of Industry 4.0 is the era of predictive manufacturing. Dr. Sun's expertise is in the research of composites, biomedical materials, degradable polymer, plastic material application in industrial designs as well as polymer rheology, polymer processing and polymer physical properties. He has a doctoral degree of Polymer Science at University of Connecticut and was previously the Director at Material Research Center of CoreTech System (Moldex3D). He is now with People-Centric Innovation in Smart Manufacturing.